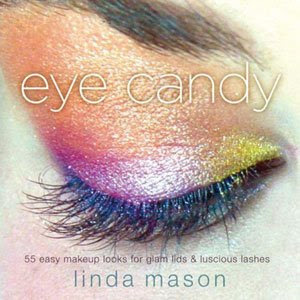 This blog entry started out as a book review of a book I love, Eye Candy (Mason, Linda, New York, Watson-Guptill Publications, 2008, $14.95). The book is written by Linda Mason, a New York makeup artist for over 30 years. It is a collection of 55 eye shadow "looks" done up on regular clients, friends and family. Long story short: it's good. I say that the entry started as a book review but as I was writing, I remembered that Linda had put together a fun little promo video on it, and so I went to her site to find the link. And then I just got lost in her site. O-M-Double-G. I want to be Linda Mason. I think, if you are making your own cosmetics and are looking for inspiration, you might want to be her to. Enough of what I think, go to her site: lindamason.com. Spend the rest of your time browsing it. You will be inspired, I guarantee. I've had that book in my hand several times and never bought it. I may just go get it now. Her work is inspiring! Yeah, I mean the book itself is fun, but I think her site is just great. Her personality really comes through, and over the years she has created a neat niche business.